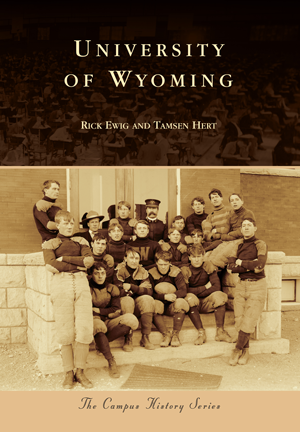 The University of Wyoming was founded in 1886, four years prior to statehood. Provisions of the 1862 Morrill Act, also known as the Land Grant College Act, allowed for the teaching of agriculture, mechanic arts, and military tactics but also included literary and scientific studies. With statehood in 1890, the constitution confirmed the establishment of the university, that all students, regardless of gender or race, could attend, and that the cost of instruction "may be as nearly free as possible." From a humble beginning in athletics, UW has excelled in football, basketball, and rodeo and has produced such notable figures as Kenny Sailors and Curt Gowdy. Statewide outreach has always been a focus, resulting in a research center in Grand Teton National Park and agricultural farms in many communities. Wyoming's economy relies heavily on the energy industry, and today, the university is a leader in energy-related education and research. Many of the photographs in Campus History Series: University of Wyoming were taken by long-serving university faculty, providing an interesting glimpse of UW's 125-year history. Tamsen Hert, head of the Emmett D. Chisum Special Collections at the University of Wyoming Libraries, holds master's degrees in library science and history from Emporia State University. Rick Ewig, associate director of the American Heritage Center, holds a master's degree in history from the University of Wyoming.